Flying into the city of Oaxaca at night, Talea de Castro is one of the countless tiny pockets of light twinkling from the darkness below. These earthbound clusters of stars mark small pueblos nestled in the treacherous mountains of the Sierra Norte. The remote terrain of Oaxaca’s Sierra Norte and Sierra Sur has helped to preserve the traditions of these indigenous communities — but at a high price. It has also hindered access to technology that could benefit residents of these communities and has made it easy for the “powers that be” to ignore the needs of these villages. Taking matters into their own hands, I love what the people of Talea de Castro have done. AFP – Left out by telecom firms like the one owned by billionaire Carlos Slim, a remote Mexican mountain village now runs its own mobile phone network to communicate with the outside world. Tucked away in a lush forest in the southern state of Oaxaca, the indigenous village of Villa Talea de Castro, population 2,500, was not seen as a profitable market for companies such as Slim’s America Movil. So the village, under an initiative launched by indigenous groups, civil organizations and universities, put up a perch-like antenna on a rooftop, installed radio and computer equipment, and created its own micro provider called Red Celular de Talea (RCT) this year. Now, restaurant manager Ramiro Perez can call his children and receive food orders on his cellphone at a cheap price in this village dotted by small homes painted in pink and yellow. The local service costs 15 pesos ($1.2) per month — 13 times cheaper than a big firm’s basic plan in Mexico City — while calls to the United States, where many of the indigenous Zapoteco resident have migrated, charge a few pennies per minute. “I have two children who live outside the village and I communicate with them at least two or three times per week,” Perez, 60, told AFP. Before, Perez had to use telephone booths where he paid up to 10 pesos ($0.75) per minute. 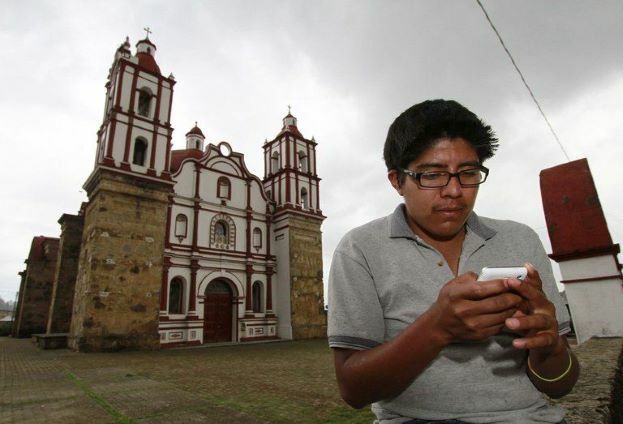 A local resident uses his mobile phone in Talea de Castro, Oaxaca State, Mexico, on August 17, 2013. For considering it to be slightly profitable, the big companies of mobile telephony refused for years to give its services in Talea, but the population — mostly of indigenous origin — adopted a novel system and created its own company, the Red Celular de Talea (RCT) (Talea Mobile Network). 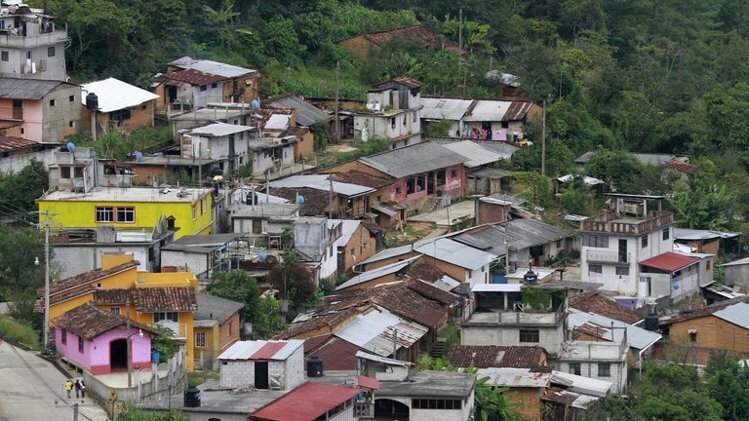 The coffee-producing village installed the network with the help of Rhizomatica, a non-profit with US, European and Mexican experts who aim to increase access to mobile telecommunications in communities that lack affordable service. In a statement, Rhizomatica, a civil group named Redes and a town official said they hoped that a telecom reform pushed through Congress by President Enrique Pena Nieto to open the market will “break the obstacles” that prevent the development of such community-based projects. “Many indigenous communities have shown interest in participating in this project and we hope that many more can join this scheme,” the statement said. The equipment used in Talea, which was provided by California-based Range Networks, includes a 900mhz radio network and computer software that routes calls, registers numbers and handles billing. Calls to the United States are channeled via a voice over Internet protocol (VoIP) provider. The village received a two-year-permit from the Federal Communications Commission to have the right to test the equipment. 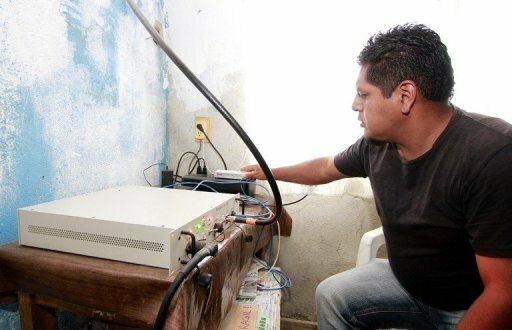 A local resident operates the equipment enabling mobile communications in Talea de Castro, Oaxaca State, Mexico, on August 17, 2013. There is one catch: phone calls must be limited to a maximum of five minutes to avoid a saturation of lines. Slim’s Telcel is part of his America Movil empire, which controls 70 percent of Mexico’s mobile phone market and has 262 million subscribers across Latin America but never made it to Talea. Alejandro Lopez, a senior town hall official, said the village had approached big telecom firms but that they had required 10,000 potential users as well as the construction of a path where an antenna would be erected and a lengthy power line. “Despite some technical problems, because we are in a test period, the project has been a success” with 600 villagers signing up since the service opened three months ago, Lopez said. Buoyed by the system’s success, the village has decided to buy its own equipment that will allow RCT to run 35 lines simultaneously and plans to install in the coming weeks. 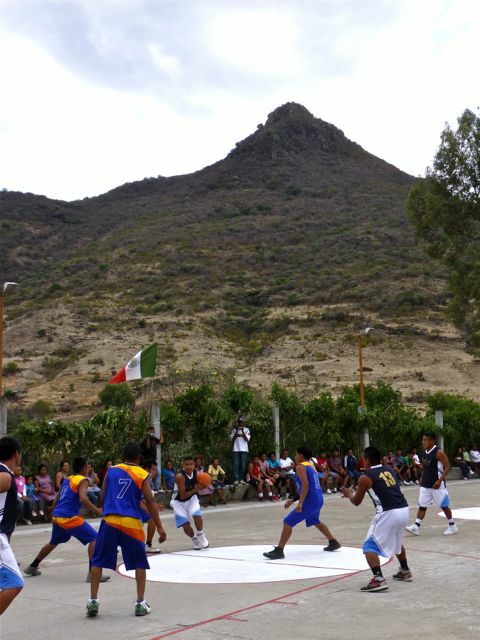 New article from the BBC: The Mexican village that got itself talking. The Fiesta de Mayo in Santa María Tlahuitoltepec lasted three days, though we were only there for a few hours on day two. There was to be a rodeo that night — a corral had been set up and bulls were arriving as we were leaving. A timeless quality… but, not to be mistaken for being frozen in time. We are already making plans to return. Saturday, we drove up into the Sierra Norte, to the Mixe region of the state of Oaxaca. Our destination was Santa María Tlahuitoltepec and its Fiesta de Mayo. We had been attracted to their unique women’s traje (costume) by the work of one of the vendors at an artesanía feria in the city a couple of months ago. She invited us to the fiesta and so we went. After winding our way up mountain roads filled with switchbacks and potholes, we turned off on a dirt road for the final ten minutes of our seventy-six mile journey from the city. We had climbed from 5,100 feet to over 7,800 feet above sea level on our three-hour drive up into pines. The name Tlahuitoltepec is made up of two Nahuatl words — Tlahuitol translates as “arched” and Tepec as “hill.” I can attest, Santa María Tlahuitoltepec is definitely built on a (very steep) “arched hill.” This is the same village that, at the end of September 2010, was hit with a devastating landslide that killed 11 residents, following record rainfall. And, as we drove up to the village, engineering work to repair and reinforce the hillside and road was visible and ongoing. We weren’t exactly sure where we were going, stopped to ask, and were told to follow the signs to “el centro.” Our first indication that we were headed in the right direction was the sound, quickly followed by the sight, of a band playing and walking in the same direction we were. It was one of three youth bands we saw and heard during our brief stay; music is obviously very important in this remote mountain village. The pueblo plays host to the Center for Musical Training and Development of Mixe Culture and according to this article, an estimated 70% of the population can read music and many who can’t, play by ear. And, along with music comes dance. Santa María Tlahuitoltepec will be participating in this year’s Guelaguetza in July — and its Ceremonia del Tepache is featured in one of the promotional videos. While there, we watched as a youth exhibition group performed three traditional dances to the appreciative crowd that filled the stands of the municipal court. The uniqueness of each village never ceases to delight and impress me. You know when you are there, because you couldn’t be anywhere else. Check out Oaxaca-The Year After for more photos from Saturday’s excursion.